Google has today unveiled Bike Directions for Google Maps. This eagerly anticipated function gives turn by turn biking directions (currently in the USA only). To use the new biking directions you need to click on the 'Get Directions' link in Google Maps and choose the 'Bicycling' option from the drop down menu. When you select the 'Bicycling' option the map view will change to show the roads and paths that are suitable for biking. 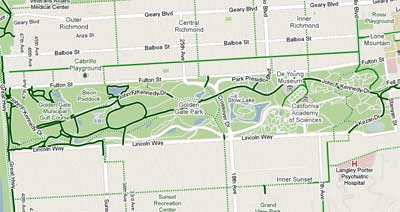 Bike paths with no cars are shown in dark green and roads with bike lanes are shown in light green. Once you have searched for biking directions the results give you turn by turn directions, with the option to view any intersections with Street View. Biking directions in Google Maps is currently in Beta and Google warns that you should use caution and report unmapped bike routes and streets that aren't suited for cycling. I just requested Bike Directions from my home in Katy, TX to a local university. Instead of routing me on a hike/bike trail which is direct, the route was on busy streets a few miles longer.